15 pockets fashioned from various old junk envelopes. The Goldenrod templates are designed in the spirit of clean lines, play with paper, summer sunshine and color, and the richness of the every day moment. This set is perfect for any summery page, any every day page or any page for which you hope to show off papers. Includes 4 layered templates in .psd and .tiff formats, with shadows that can easily be modified or removed. Also includes color coded layers and layer descriptions and tips for getting the most out of the template designs. Bloomin' Baubles are fun beaded trinkets to add a hand crafted touch to your page. Whimsical flowers made of plastic pony beads and ribbon, and bold blooms of chunky glass beads. Eight designs in 2 to 4 variations each, plus 4 leaves, for a total of 31 pieces. Shown at 100% relative to 12x12 canvas. Coordinates with the July 2012 BYOC. Don't miss my other BYOC pack, Watercolor Summer! Created at 300ppi. No drop shadows. Watercolor Summer includes a dozen hand painted watercolor papers to add a wash of color to your pages! Lively summer colors coordinate with the July 2012 BYOC. Don't miss my other BYOC pack, Bloomin' Baubles! Coordinates with the Maritime Papers. a complete .TTF font inspired by the handwriting of Amber O. What could be better than an alpha you can use over and over again? One covered in sparkles, of course! With a unique mix of clean & playful design, my Sparkle Gel Alpha will add just the right touch to all sorts of layouts. Whether you use the sparkly royal blue letters to echo sunlight shining off a lagoon in Hawaii, or to title a page about skiing in the Alps, you will find endless ways to use this joyful alpha. 1 unshadowed lowercase alpha with numbers and some punctuation. Perfectly coordinates with July 2012's BYOC. Layering different papers is one of the easiest ways to get the most out of your favorite kit- and these 3 elegantly patterned, brightly hued papers will do just that - lending a cheerful addition to your page with just the right amount of "boho chic." 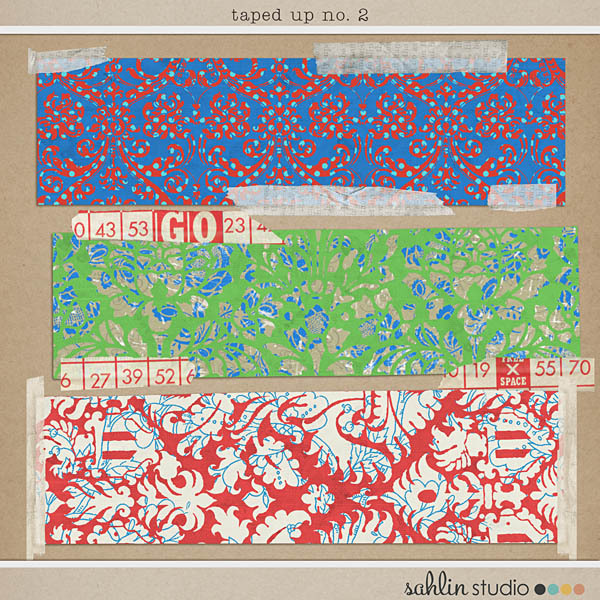 Gorgeous when used alone as a design focal point, and even more fantastic when combined, repeated or layered, Taped Up: No.2 swatches add just the right amount of color and texture to your page. Tape elements come prearranged on 4 separate layers for a quick and realistic "attached" look. By combining the paper and tapes to suit your creativity, you make this a beautiful AND versatile pack for your stash!